Clerics are a well-rounded class that can switch roles as a support, defense or offense depending on the situation, and is the class with the highest base hit points among the six classes. 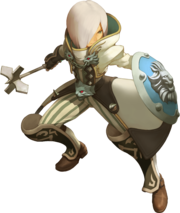 Cleries focus on Light-based magic and defensive skills, capable of weakening enemy Light Resist and attacking using holy lightning while mitigating damage by using Block and Shield Blow. They are known for being durable in combat, and their ability to electrocute enemies by chance is able to compensate for their lack of mobility skills and sluggish movement speed.